Although I pride myself on having original style, I still do love to check out what is hot off the presses and I am certainly not immune to the lure of the latest and greatest. 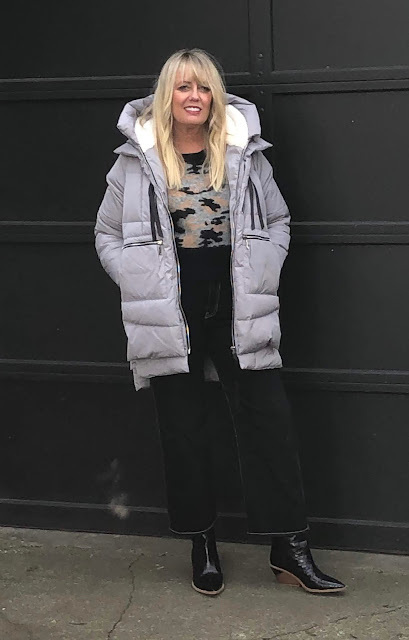 Last week one of the bloggers I like and follow, Jacey of Damsel in Dior, had the green version of the Orolay Thickened Down Jacket on her Instagram stories. She had seen it on Something Navy blogger Arielle Charnas, who had loved it on a woman in her building. You get the picture. By the time I had fallen in love with this coat it had already been touted in New York Magazine, People Magazine, and on "The Today Show". Not to mention half of the Upper East Side in NYC. I might mention that I do have a crazy amount of coats in my closet. That being said, a stylish longer puffer coat had eluded me. I have always felt like I was wearing a sleeping bag in most of them. The Orolay coat cocoons you in warmth but in a stylish way. It is the coziest and cutest coat ever, and it is, surprise! on Amazon for $130. What? I ordered the pearly grey color and it zipped to my house via Amazon Prime in the drop of a hat. Not only did I fall in love with the style, which high/low hem is long enough for covering your bum and keeping you cozy, but also the style. The contrast black zipper and ribbon pull details and cozy faux shearling hood make is chic. You can zip the sides to bring the silhouette in or make it bigger if you are wearing a thicker sweater. I wore it out to an appointment the day after I received it and three people I ran into ordered it off their phones after they saw me. Do I mind that there are millions of these coats running around? Nope. It is the ultimate compliment to have someone like something on you so much that they seek it out and buy it for themselves. Besides, that ship has sailed. What I love most about this great find is that it has the look of luxury without the price tag. While my style tends more towards designer consignment and investment pieces, I also appreciate a great find, a Target style and a fun Zara piece. High/low dressing is the key to a great closet. You can find this coat in navy, black, grey, army green and beige here. Give me a shout if you decide to take the puffer plunge, and check back on the blog soon for more fashionable finds.